Gone In 60 Seconds is a mostly terrible movie but it does have some nice stunt driving. A group of GTA 5 players decided to reenact one of the best stunts within Los Santos. In the film scene, Nicolas Cage is fleeing from the police in a 1967 Mustang. He reaches the Vincent Thomas bridge, only to find that it's blocked with traffic. Fortunately, there's a tow truck nearby that he can use as a ramp to jump over many, many cars. Still, this reenactment nails the crucial detail: the bugshit crazy jump. It looks as improbable and cartoon-like here as it does in the film. It's not as insane as jumping between two cargo planes or flying through the Vinewood sign but it's still glorious. Thank god for conveniently placed tow truck ramps. 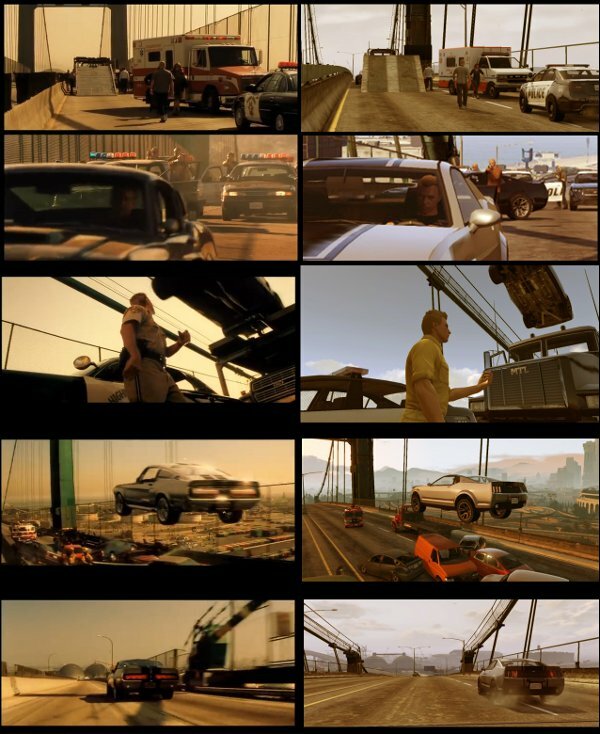 Recreating movie scenes has become a very popular hobby for GTA 5 players as of late. Last month gamers acted out the train scene from Skyfall. Another group created a parody of the Purge: Anarchy trailer. GTA Online players who don't want to make movie reenactments will have some new diversions soon. The game will receive an update tomorrow that lets players create their own Capture Mode jobs. Rockstar is also planning to release a High Life DLC pack soon that adds new jobs, apartments and vehicles to the game.